WASHINGTON: The shooting incident on Wednesday at the headquarters of the US National Security Agency outside Washington does not appear to be a terror attack, an FBI official said. "There is no indication that this has a nexus to terrorism," said FBI Special Agent in Charge Gordon Johnson. 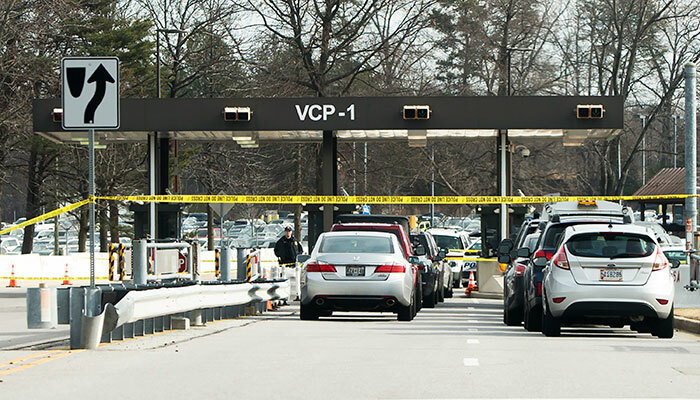 Three people were arrested after their vehicle crashed at the entrance to the ultra-secret US spy agency in Fort Meade, Maryland, Johnson said. One of the three was injured and sent to a hospital, and the other two are in custody. Two other people — an NSA police official and a bystander — were also injured and sent to hospital, he said. Shots were fired early Wednesday at the ultra-secret National Security Agency, the US electronic spying agency outside Washington, leaving one person injured, officials said. Aerial footage of the scene from NBC News showed a black SUV with numerous bullet holes in its windshield crashed into concrete barriers at the main entrance to the NSA's headquarters in Fort Meade, Maryland. The images showed what appeared to be police surrounding a man on the ground in handcuffs. "The situation is under control and there is no ongoing security or safety threat," the NSA said. "We can confirm there has been one person injured and we don't know how the injuries occurred," an NSA spokesman told AFP. The local ABC television affiliate put the number of injured at three and said a suspect was arrested. The Baltimore office of the Federal Bureau of Investigation, which is handling the investigation, said the incident "has been contained." A law enforcement source told AFP that it was too soon to know whether the incident was an attack on the facility or otherwise. They are "still trying to ascertain the facts," the source said. "The president has been briefed on the shooting at Ft Meade," the White House said in a statement. "Our thoughts and prayers are with everyone that has been affected." The NSA is the premier US signals intelligence agency, eavesdropping on electronic communications and hacking computers of US adversaries and suspects worldwide, and also protects US communications and information systems from cyber attack. The agency was thrust into the spotlight in 2013 when former contractor Edward Snowden leaked details of its global surveillance programs, including its collection of data on Americans. Its compound, known as the "Puzzle Palace" - located about 32 kilometers northeast of Washington - is highly secure. In March 2015, guards at the NSA gate opened fire on an SUV which did not heed orders to stop, killing the driver and wounding a passenger. The two involved, it turned out, were men dressed as women who made a wrong turn into a restricted lane and may have refused to stop because, it later turned out, there were drugs in their vehicle. The leading US spy agencies installed heavy security at their facilities after an assault rifle-wielding man opened fire on cars waiting to enter the Central Intelligence Agency's headquarters compound in McLean, Virginia in January 1993. Two CIA employees were killed and three wounded. The man, Aimal Kasi, was eventually arrested and convicted of murder and executed in 2002. In 2016, a man drove his car into a fence gate at the CIA headquarters, claiming he was an agency recruit. He was arrested but was found to be mentally unstable, and only received 30 days in jail and a fine.